Sri Shaligram is Mostly black holy stone found in Sacred River Gandaki and Muktinath in Nepal. Even though mostly shaligrams are black in colors and black are usually worshipped in every home and Temples. Sometime other rare color of shaligram like blue,green ,white and others are also found. Rare vishnu (Narayan shaligram - Shankh chakra gadha padma).. The Sacred shaligram stones are worshipped in Everyone House and Temples. Shaligram is direct symbol of God vishnu(Narayan).God vishnu is also known as Patron or main Hindu god. He is also known as Protecter of creation,where as Lord brahma the creator and Lord shiva destroyer of Evil in this big creation of World. There are also Various types of shaligram which are associated with different names and incarnation of god vishnu. Full List. Shaligram is also known as Shaligram shila. The "shila" meaning the sacred form of lord in Self appeared deity form or represent deity when we establish in specific home or temples. In many place of india like tamil nadu,banglore,Mostly in south india people also say saligrama,salagram or salagrama .saligram sila to represent its name. 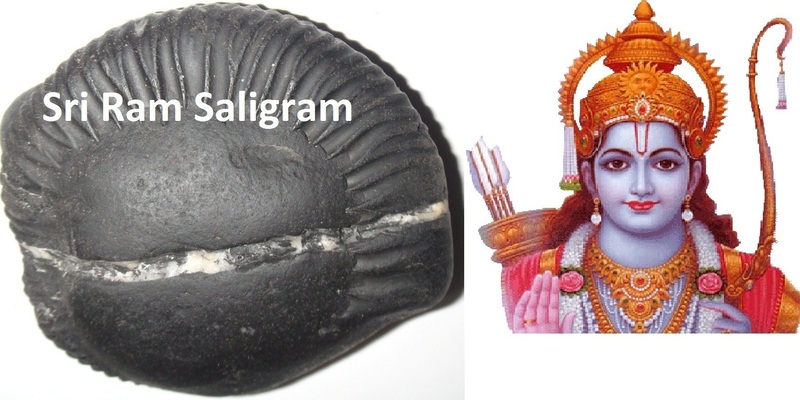 Whereas shaligram is widely well known names for hindus and vaisnava denotes the same. Mostly in india shaligram are found in every one house which was kept and worship in their house from many years from ancestor to ancestor. Before many years also many devotees use to visit gandaki and muktinath River of Nepal for muktinath darshan,shradhha,and to puja shaligram. 1) Every shaligram donot have similar shape and size. The form of lord vishnu are incountables. So Lord vishnu is known as Anantha (Incountables or Many). 2) Shaligram can be round, many are smooth, Many are emblem with Chakra (Wheels), Some are big whereas some are small,Some have few small holes, Some are oval,flats. We should always worship good shape,not broken,smooth and good shaligrams . 3) Worship of shaligram provide four values. 1) Dharma (Religious values), 2) Artha (Wealth), 3) Kam (Working value), 4) Moksha(Salvation). 4) Those who worship in their home and temples are always protected by lord vishnu. Worshipper of shaligram are always blessed by Mother laxmi (hindu goddess of prosperity and wealth). To make Laxmi narayan happy every one should keep shaligram in their home or temples. 5) Worshipper of shaligram donot get fear from ghost,evil,demons or Un-usuals fears. So devotees of shaligram (vishnu bhagwan) are always protected by Demons,evils. 6) Worshipper of shaligram are blessed with long life,Prosperity and happiness. 7) While worshipping shaligram every days. The tulsi leaf must be offered to shaligram (vishnu). So where shaligram are installed ,there must be tulsi leaf also. Because tulsi is favourite leaf or flower of lord vishnu. So while worshipping shaligram,tulsi are offered to make him easily happy. 8) We can worship any types of shaligram in our home but we should not worship broken shaligram. Both shaligram who have wheels or without wheels(chakra) are equally important. So we can worship any one of them.